(besides taking a dip in the pool of course). 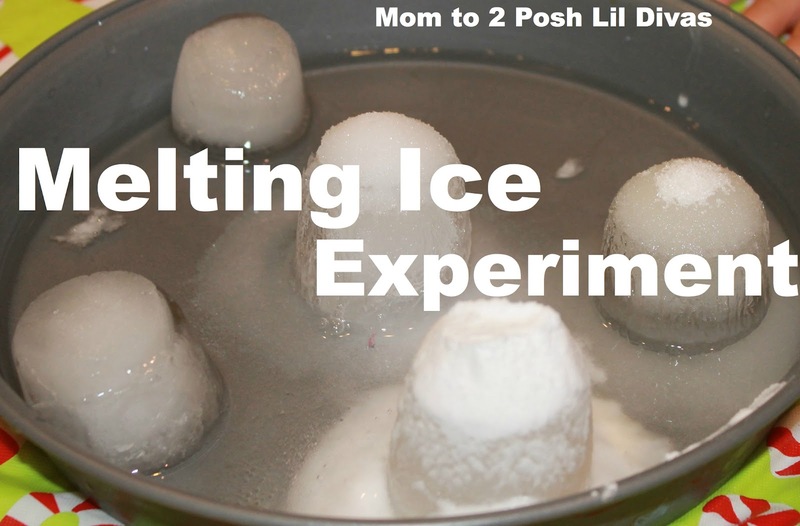 It's been awhile since we had fun with a science experiment so I really wanted to incorporate some investigation, experimentation and discovery into our ICY FUN WEEK. What Melts Ice the Fastest? 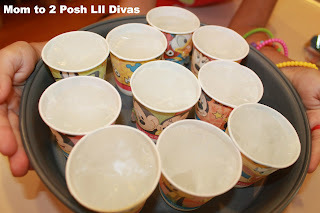 Prep: Freeze cups of water - 1 for each substance used. 1. 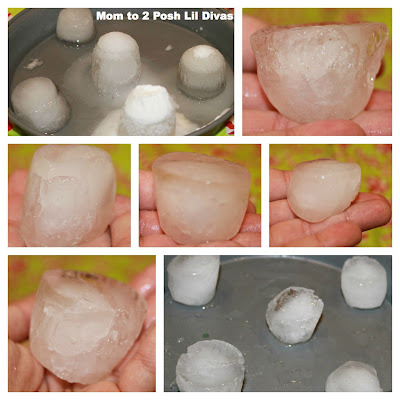 Remove ice from cups and put on a dish or tray (be sure it's deep enough to retain the melting ice water). 2. Have substances to be used readily available along with spoons and droppers for pouring. We used measuring scoops and turkey basters. 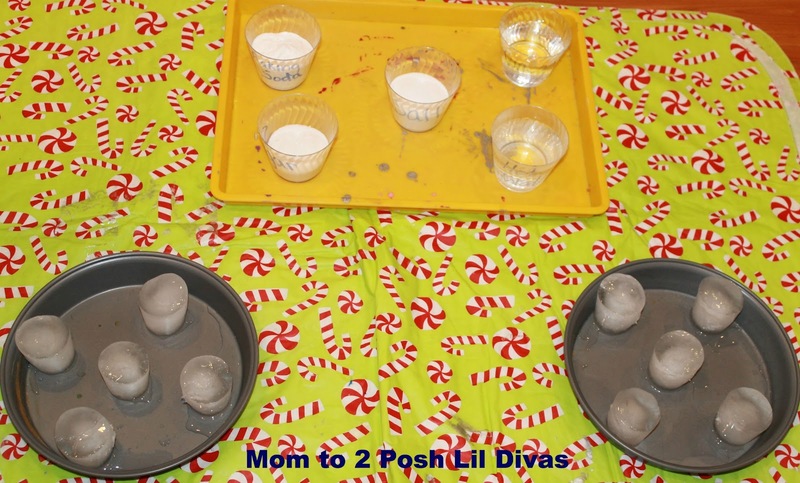 To begin we discussed what we were to do and the Lil Divas made predictions over which items they thought would melt the ice the fastest. 3. Have child(ren) add substances to each ice block and note the immediate reactions. Did it affect the ice? Is it penetrating? Did it cause the ice to melt? 4. Let sit for approx. 5 minutes. 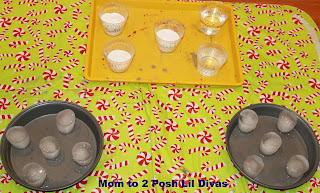 Turn the ice blocks over and repeat - add the substances and discuss any reactions. 5. Let sit for approx. another 5 minutes and discuss what has happened to the ice. Which one is melting the fastest? Slowest? Discuss any noticeable changes - cracks, holes, etc in the ice. The Lil Divas found that hot water melted our ice the fastest, followed by vinegar, salt (which penetrated the ice and caused lots of holes and cracks) and then sugar (it also penetrated the ice and caused cracks but not nearly as pronounced as the salt). The baking soda had very little effect on the ice. It was the one block of ice that remained pretty intact, melting mostly due to exposure to the heat in the room and the other liquids in the pan. 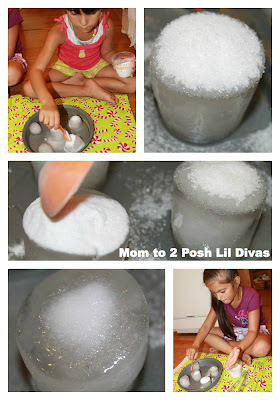 The Lil Divas enjoyed our icy experiment. We ended up watching the ice melt to its complete liquid form at their request, while they continued to scoop the different substances on the ice. I think they rather enjoyed the concoction the whole thing was making since we inevitably ended up with some fizz from the baking soda and vinegar being so close together and mingling in the pan. Be sure to discuss if the predictions made were correct and what was learned. The Lil Divas were quite surprised that baking soda had little to no effect on the ice and that sugar did in fact make cracks in the ice. 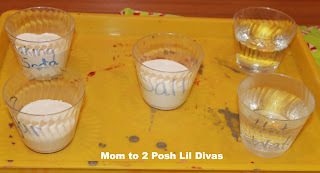 They initially thought the sugar would have little effect and that the baking soda would - I think that stemmed from all of our past baking soda & vinegar experiments. Do you know of any other substances that have an interesting effect on ice? I am surprised too that the baking soda had no effect. Very cool experiments. Will pin this! Rebekah, I was too actually but it really just sat on top of the ice and didn't do much at all. Thanks for pinning! We have this experiment on the list for this summer. Can't wait to try it ourselves. Looks like a lot of fun. Thanks for sharing. Oh, Shelle be sure to let me know what you use to melt the ice. I'd love to hear about your results! Allison, that part was hard for my girls too. We set the kitchen timer and went to do something else (snack, game, etc) and the time passed quickly. Wonderful experiment! My son is barely 3 and wouldn't understand the science behind this, will save this activity for next year :) thanks again! Kid's find science so interesting when they get to experience a cause and reaction. You could also add an extra plain ice cube that's just left on it's own as a test subject and see how long that takes to melt. Then you can add in the extra question of whether the kids think each added substance will make it's cube melt quicker or slower than the test subject. :) Pinning this. great activity,thanks so much for sharing on Craft Schooling Sunday! Thank you for such a great experiment. I'm using this in my sons 1st grade class this week, highlighting the season "Summer". We are adding a hairdryer to the experiment to show that even though other things melt the ice, heat is always the fastest. My son thought this was so awesome at home...I can't wait to show his whole class! BTW - it took the blowdryer 5 minutes to melt completely whereas no other ingredient was close.